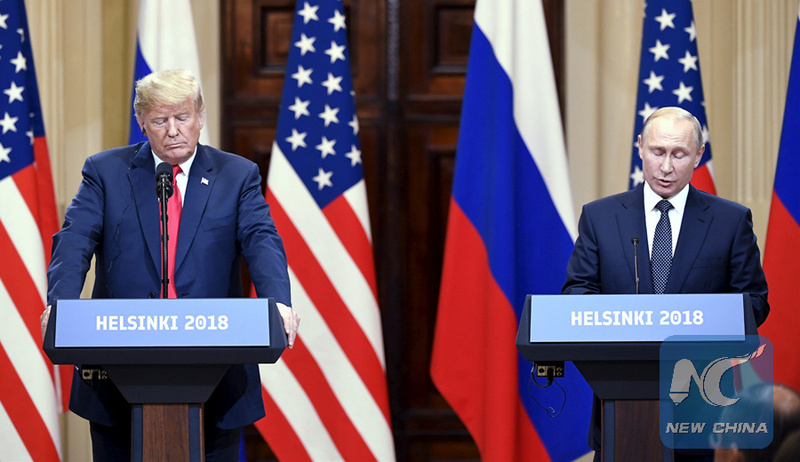 MOSCOW, Aug. 9 (Xinhua) -- Moscow criticized new U.S. sanctions on Russia and vowed retaliation on Thursday in a fresh round of spats that could smother a glimmer of hope from a recent Putin-Trump meeting that bilateral ties may improve. The U.S. decision to slap new sanctions on Russia is an unfriendly move and inconsistent with the constructive atmosphere created after the Putin-Trump meeting last month, Kremlin spokesman Dmitry Peskov said. The U.S. State Department said Wednesday that Washington will impose new sanctions on Russia over the alleged poison attack on ex-Russian spy Sergei Skripal and his daughter Yulia in the British city of Salisbury in March. Western countries claim the pair were exposed to a nerve agent and hold Russia responsible, while the Russian government has repeatedly denied any involvement in the case and demanded direct participation in the investigation. "We consider it absolutely unacceptable to link the new restrictive measures that we still consider illegal to the Salisbury case," Peskov said. "We once again most emphatically reject any accusations in the context of a possible involvement of the Russian state in what happened in Salisbury," he added. Following a 15-day Congressional notification period, the U.S. sanctions will take effect upon publication of a notice in the Federal Register, expected on or around Aug. 22, U.S. State Department spokesperson Heather Nauert said, giving no details of the restrictive measures. According to Russian Foreign Ministry spokesperson Maria Zakharova, the U.S. restrictions will possibly include a ban on foreign assistance to Russia and sale of military and dual-use items to the country, as well as renunciation of providing state loans and other financial aid. "The United States conscientiously opts for a further aggravation of bilateral relations, which are already practically reduced to zero thanks to its efforts," Zakharova said. Instead of starting to look for ways to improve relations as was discussed during the Putin-Trump summit in Helsinki in July, "the U.S. administration spares no efforts to complicate the situation even more," she said. "The Russian side will start examining response measures to the new unfriendly move of Washington," Zakharova said. Russian President Vladimir Putin met with his U.S. counterpart Donald Trump last month in Helsinki, during which the two leaders voiced their satisfaction with the meeting as a "very constructive" one marking the "first important step" towards better ties. The new U.S. sanctions against Russia mean that the two countries are "slipping into an economic war" and bilateral ties are reaching "a point of no return," said Vladimir Vasilyev, chief research fellow at the Institute of the United States and Canada. "The economic war requires a strategic decision from the Americans, and they have already made it clear that while Russia has the current president at its helm, there will be no improvement in relations with Russia," the expert said. Despite the atmosphere of the Putin-Trump summit, Vasilyev predicted that until the end of the presidential term of Donald Trump, there will be no positive change in Moscow-Washington relations. Russian political scientist Yevgeny Minchenko said it is important for the current U.S. authorities to show that they are tougher towards Russia than the Obama administration. Washington also needs to "demonstrate that the solidarity within the North Atlantic Treaty Organization is not questioned: if Britain said Russia is to blame, then it is," he said. The Russian ruble kept weakening against the U.S. dollar for the second day on Thursday in wake of the new sanctions. The currency traded around 66 per U.S. dollar on Wednesday and Thursday, marking the lowest level since 2016.